This example represents one of several types of enamelling work of the middle period of the Qianlong era, from sometime in the 1750s to sometime in the 1770s. 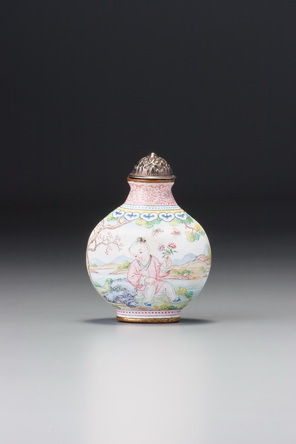 It is part of a broad but distinctive group of enamels in which a series of features define the group as a whole, although not all features are common to every bottle. Shapes tend to be fatter, broader, and more substantial. The palette remains the same, but its use is different, giving the impression of lighter, less dense designs with a greater emphasis on pastel shades. The landscape takes on a more dominant role in a compositional equation that, in turn, leads to a much greater sense of space. This sense of space is accentuated by another feature of the group: continuous designs. Instead of the ubiquitous panels of decoration reserved against densely decorated, floral surrounds, borders are relegated to neck, shoulders, and around the outer footrim, allowing more space for the main decoration. The heads of figures are generally larger in proportion to their bodies (with this example due as much to the narrow shoulders of the woman as to too large a head, but in other examples more noticeable, particularly with children). Borders, apart from becoming more of a background decorative feature, are also distinctive. The occasional narrow band of ruby-red scrolling vine on a paler ruby-pink ground found on some of the earlier wares becomes a broad neck band, often with large flower heads as a focal point. These dark-on- light bands of the same colour are typical of palace enamelling and on this group appear also in blue. Other features of the borders for the group are bands of repeated dots, again often of dark-on-light of the same colour, or of iron red on yellow; a series of repeated, simplified, formalized lingzhi resembling the head of a ruyi-sceptre, often in two tones of blue, as on this example; and more prominent use of simple bands of monochrome colour placed horizontally. Reign marks are still very carefully drawn, in formal, regular script and blue enamel, but are often rather larger than on earlier examples. Another major difference lies in the metalwork at the neck. On Kangxi, Yongzheng, and early-Qianlong enamels on metal, the mouth is wide, the lip narrow. Often the lip is no wider than the thickness of the wall of the bottle, rounded off, and with additional gilding; sometimes the lip is shaped to give a flat, although still narrow, lip with a sharp-edged profile, in which case there is a concomitant straight cylindrical inner neck. On the group from the mid-reign, however, a separate plate of metal is often added to the neck and the mouth cut through it; it is as if a washer had been welded to the upper walls of the original neck, leaving a circular ‘shelf’ as the lip. 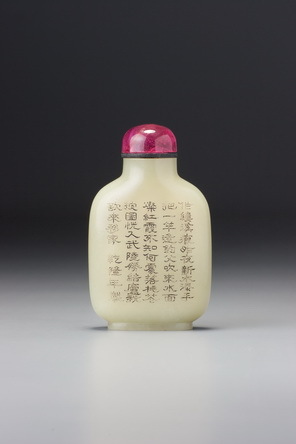 This may reflect a mid-Qianlong shift in fashion towards narrower mouths for snuff bottles, ending up with the virtuoso tiny mouth on some hard-stone bottles (typical examples of which are found on the range of plain, rounded-rectangular white nephrite bottles of the period that were probably imperial products). There are several points of reference, particularly in the drawing of the landscapes and trees, between the decoration on this group and various Guangzhou wares of the Qianlong period, some of which can be reasonably dated to the mid-Qianlong reign. This suggests that the group may have arisen out of a Guangzhou enameller or a Jesuit artist being seconded to Beijing and bringing with him recent styles current in the south — derived, perhaps, from fresh designs from Europe reflecting a change in artistic style there. In this respect, it is interesting to note the completely flat foot here, level with the rim — a common feature on Guangzhou enamels of the Yongzheng and early Qianlong periods, but quite unusual on early-Qianlong Beijing wares, where a concavity is standard even when the footrim is barely recessed at all.